Or Yehuda, Israel, March 15, 2016 – Formula Systems (1985) Ltd. (NASDAQ: FORTY), a global information technology company engaged primarily, through its subsidiaries and affiliates, in providing software consulting services and computer-based business solutions and developing proprietary software products, today announced its results for the fourth quarter and full year ended December 31, 2015. Revenues for the fourth quarter ended December 31, 2015 increased 27.1% to $205.9 million, compared to $162.0 million in the same period last year. The increase of $43.9 million in revenues for the fourth quarter resulted primarily from an increase of approximately $48.7 million due to the consolidation of the results of operations of Sapiens (which were not consolidated during 2014), offset mainly by the negative impact of the devaluation of the New Israeli Shekel, Euro and British Pound against the U.S. Dollar by 1%, 12% and 4%, respectively, amounting to $3.8 million. Operating income for the fourth quarter ended December 31, 2015 increased 54.2% to $15.1 million compared to $9.8 million in the same period last year. Operating income for the fourth quarter increased by $6.4 million due to the consolidation of the results of operations of Sapiens, offset by $0.1 million due to the negative impact of the devaluation of the New Israeli Shekel and $0.9 million increase in amortization of intangible assets. Net income for the fourth quarter ended December 31, 2015 was $4.3 million, or $0.29 per fully diluted share, compared to $8.8 million, or $0.60 per fully diluted share, in the same period last year. 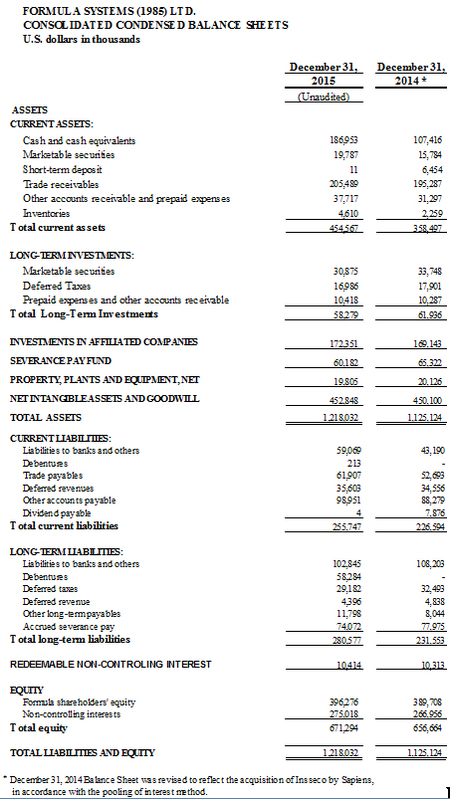 Net income for the fourth quarter showed a year over year decrease mainly due to the gain recognized in the same period last year in the amount of $4.2 million in relation to Formula’s gaining control over Sapiens and the related re-measurement of the Company's investment in Sapiens shares to fair value and increase of $0.4 million recorded in financial expenses due to the issuance of two series of debentures by Formula in September 2015. 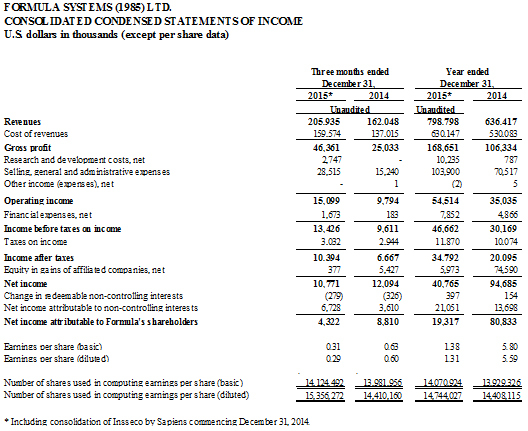 Revenues for the year ended December 31, 2015 increased 25.5% to $798.8 million, compared to $636.4 million in 2014. The increase of $162.4 million in revenues for the year resulted primarily from an increase of approximately $185.6 million due to the consolidation of the results of operations of Sapiens, offset, in part, by $27.3 million that was included in 2014 due to the partial consolidation of Magic's results of operations in the first quarter of 2014, and which were not consolidated in 2015. Revenues for the period were also negatively impacted by the devaluation of the New Israeli Shekel, Euro and British Pound against the U.S. Dollar by 8%, 17% and 7%, respectively, amounting to $66.9 million. Operating income for the year ended December 31, 2015 increased 55.6% to $54.5 million compared to $35.0 million in 2014. Operating income for the year increased by $19.8 million due to the consolidation of the results of operations of Sapiens, offset, in part, by $4.0 million that were consolidated in 2014 due to the partial consolidation of Magic’s results of operations in the first quarter of 2014. Operating income for 2015 was also negatively impacted by the devaluation of the New Israeli Shekel against the U.S. Dollar, amounting to $3.3 million. 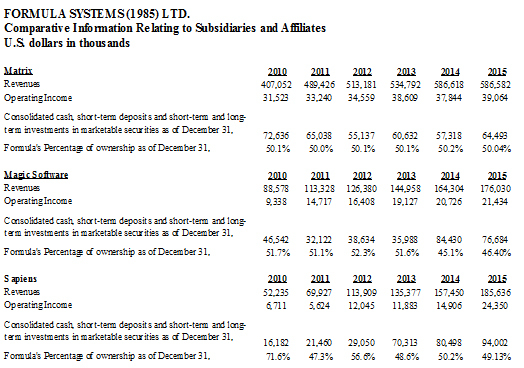 Net income for the year ended December 31, 2015 was $19.3 million, or $1.31 per fully diluted share, compared to $80.8 million, or $5.59 per fully diluted share, in 2014. Net income for 2014 was positively impacted by a net gain of $67.2 million recorded in relation to Magic Software’s March 2014 public offering pursuant to which Formula's holdings in Magic were reduced below 50%, which in turn resulted in Formula's investment in Magic being accounted from March 2014 under the equity method of accounting and the related re-measurement to fair value of Formula’s investment in Magic. Consolidated cash and short-term deposits and short-term and long-term investments in marketable securities totaled approximately $237.6 million as of December 31, 2015. 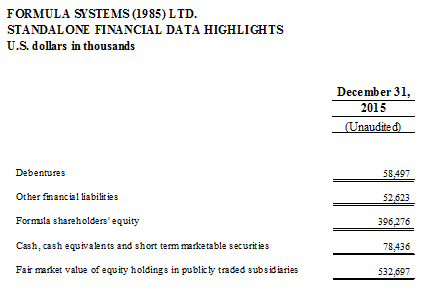 Total equity as of December 31, 2015 was $671.3 million (representing 55% of the total balance sheet). As of December 31, 2015, Formula was in compliance with all of its financial covenants.